where I have talked about some of their products and also their event that I've attended. I have been given products from their company to review on. They will be sending me boxes of cosmetics based on their theme of the month for me to review on and introduce their products to my readers! 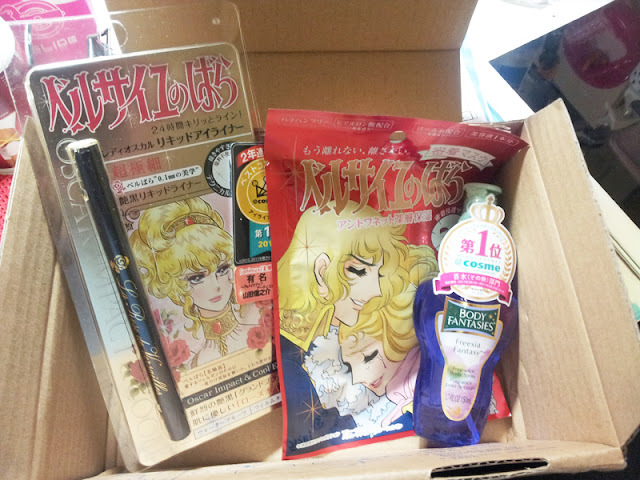 Since most of us are fans of Japanese cosmetics, so why not stay tuned to my blog on Haraju-cute! and get to know more about the *hot* brands in Japan! It's true that we always read magazines and get to know many Japanese products by looking at the models using them and raving about them, but sometimes, it might not seem realistic to us. It's like reading from a fairytale and looking at beautiful pictures, not being able to get hold of the products and dreaming to try them on. One known fact is that these products are coming to us! It is no longer a dream to own these products which our favorite model used. Most of us Singaporeans would prefer reading and finding out more about certain products before making a purchase, some of us would not buy every season of the magazines and tend to miss out some of the star-products. So here's my blog and Haraju-cute to the rescue! Let me show you what is inside of Haraju-cute! Japan Cosme #01 ! Which was to let me feature the products that have won the cosme.net's, #01 place, honour. This fragrance have been featured in magazines such as Mina, up and Zipper. It had been voted 1st place by Cosme.net (by consumers) in Japan under the fragrance catergory. It is know for its long lasting, fragrant and energizing effect. -The fragrant is light and fresh. -It is a common scent! I don't use much of these fragrance most of the time but I would when I need an additional tint to my 'attractiveness'. This fragrant is really a great economical choice if you just need something to hype you up in a normal event. It is great for school use as well, maybe after some physical training in school. 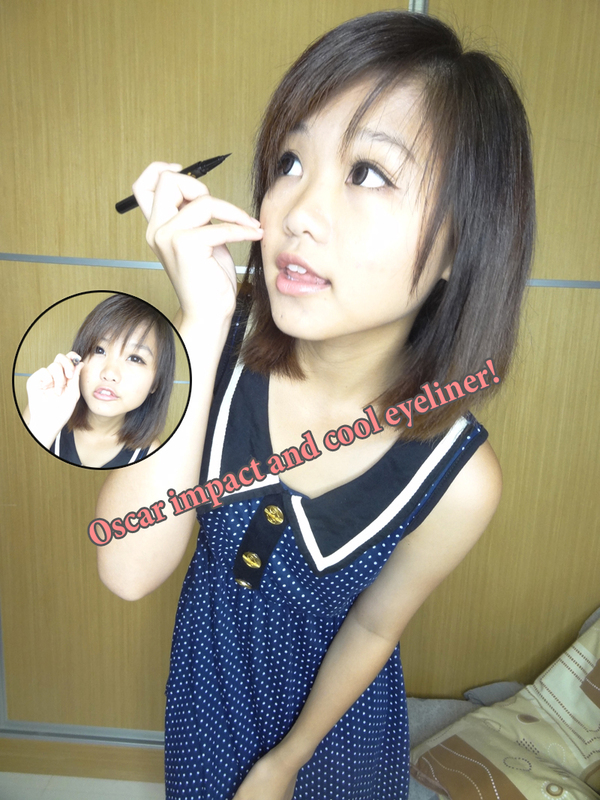 This eyeliner have been rated 1st place overtaking Dollywink liquid eyeliner! It was quite of a surprise for me when I saw that it was rated the best eyeliner for consecutively two years. It is known for it's super smudge proof, film forming smudge free, elastic fine brush and constantly strong colour. It really does as it says to be and I am really shocked. I have been a strong supporter for Dollywink Liquid Eyeliner for it's ease of use. Yet, there's still pros and cons for both the eyeliners. I would keep both in my make-up box and use them according to the look I would like to achieve. As for you girls, you can always try a new eyeliner and decide on which one you prefer. I can't decide on which one to use permanently so I have decided to own both of them or according to situation. -It doesn't smudge during a sad movie when your tears are rolling. -Falls off easily if you have itchy hands. The eyeliner costs SGD23.90 which is quite affordable to most of us. The design is really sleek and non-cute, good for working adults. This mask have also topped the boards in Cosme.net (under the mask category)! Just how many number ones are they holding on to! The mask is known for its moisturizing effect, gentleness on the skin and maximum penetration into skin. There are many many masks in the market and it has made choosing mask a chore for most of us. The masks are always similar is functions and effects. I can say that almost all the masks I tried are really awesome. -Too common and many similar products in the market. This is one of those that I find very good too. However, it is slightly too costly. I think it really depends on that you are looking for but to be very honest, I find this mask and it's effect too common, slightly pricey as well. It is good to try though, since it is rated top in the mask category in Japan, why not? I believe that everyone will find this mask good, just that, it's not my best choice. Yet, it might turn out to be your best choice. Do remember to visit Guardian for your Haraju-cute! 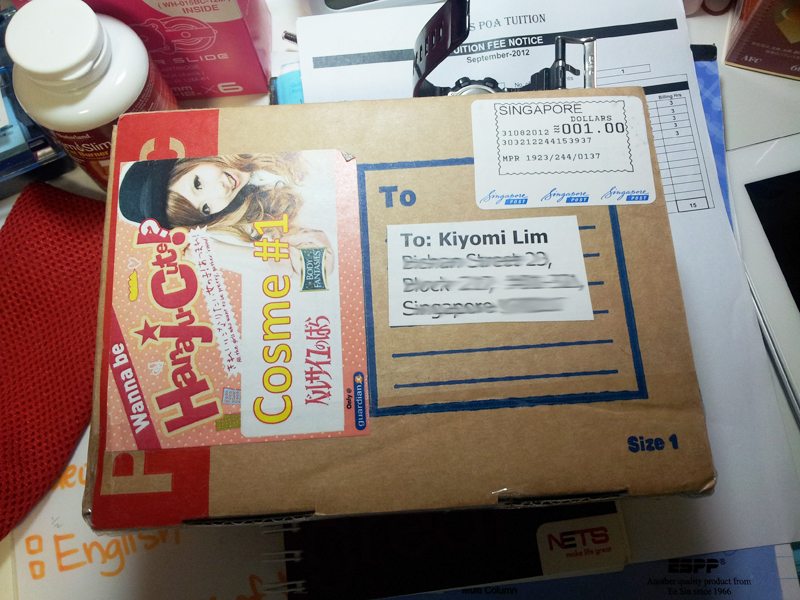 hauls of your favorite Japanese products!